Debuted with one of the biggest blockbusters of Bollywood ‘Dangal’ Sanya Malhotra looks classic on the cover of Wedding Affairs magazine. 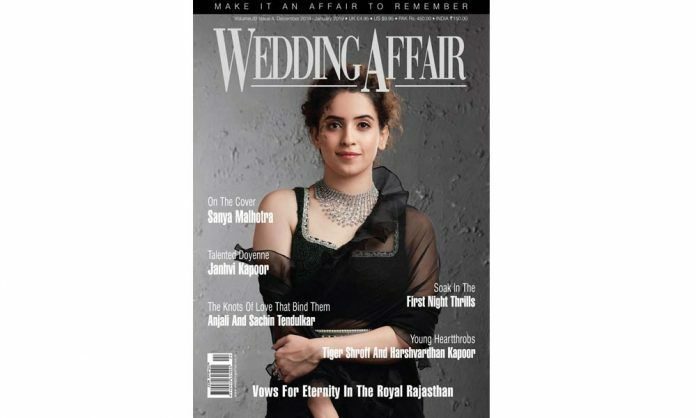 With minimal makeup and jewellery, the actress wore a black netted dress with only a diamond necklace.on yet another magazine cover for their December edition. Sanya has extensively spoken about her career graph and 2 films releases in a small span of time. The actress has spoken how she always tried her best while working and always tries to give her best which makes her wanting for more. Sanya played 2 diversly different character in her last 2 films, Pataakha, which was directed by Vishal Bharadwaj and Badhaai Ho directed by Amit Ravindernath Sharma. In Pataakha the actress played the role of a girl from a very small Village of Rajasthan, which is based on an acclaimed short story by renowned writer Charan Singh Pathik, and in Badhaai Ho she plays Delhi girl who knows whats she wants in her life.